Welcome to advanced GPS navigation. 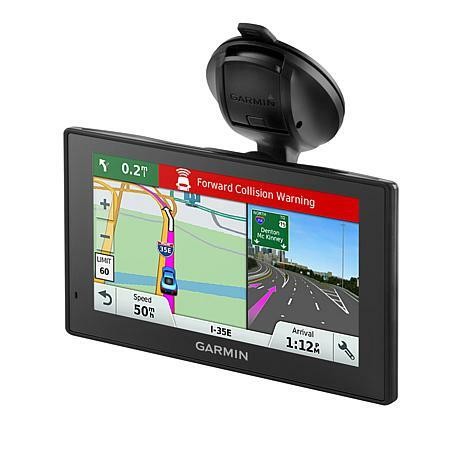 This Garmin GPS helps you keep your eyes on the road and your hands on the wheel for distraction-free driving, but that's just the beginning. 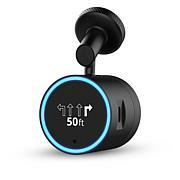 A built-in dash cam provides a record of your road trip and any incidents along the way. It also provides camera assisted alerts to keep you focused on your driving. 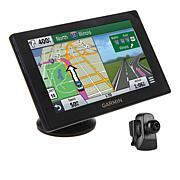 It works seamlessly with Garmin backup cameras and smartwatches too. 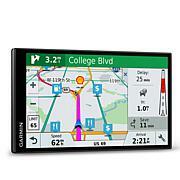 When it comes to smart GPS, Garmin is at the head of the class. To access live information, you must download the free Smartphone Link app. This GPS receiver is not intended to be used indoors such as in a garage or under an overhanging structure. If the unit is not receiving a strong enough satellite signal, move to a location with a clear view of the sky. Drivers in California and Minnesota are prohibited from using suction mounts on their windshields while operating a motor vehicle. Measurements: Approx. 5.5"W x 3.3"H x 1.1" Deep Approx. 7.2 oz. Just designate your chosen contact phone and they will automatically receive a text message unless you cancel the message prompt before it sends. The text notification includes a map link to where the incident occurred. Lots of safety features on this model and a built in dash camera in case of a problem. 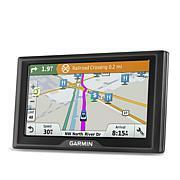 We feel much safer on the road.We have used Garmin for years. We love it! My husband is very happy!! I think this gadget is awesome and I appreciate the fact that it is multifunctional. I own three, and one Magellan. I rarely use the Magellan, so sorry! This is my 5th Garmin, it's better than all I had before.